The theory of automorphic forms has seen dramatic developments in recent years. In particular, important instances of Langlands functoriality have been established. 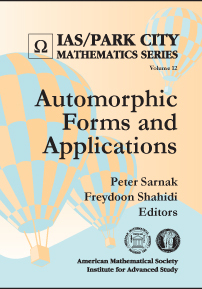 This volume presents three weeks of lectures from the IAS/Park City Mathematics Institute Summer School on automorphic forms and their applications. It addresses some of the general aspects of automorphic forms, as well as certain recent advances in the field. The book starts with the lectures of Borel on the basic theory of automorphic forms, which lay the foundation for the lectures by Cogdell and Shahidi on converse theorems and the Langlands-Shahidi method, as well as those by Clozel and Li on the Ramanujan conjectures and graphs. The analytic theory of GL(2)-forms and \(L\)-functions are the subject of Michel's lectures, while Terras covers arithmetic quantum chaos. The volume also includes a chapter by Vogan on isolated unitary representations, which is related to the lectures by Clozel. This volume is recommended for independent study or an advanced topics course. It is suitable for graduate students and researchers interested in automorphic forms and number theory. Graduate students and research mathematicians interested in automorphic forms and number theory. The authors are some of the greatest masters in their fields, and they have made a real effort to open up the subject. ... The resulting combination of insight and (relative!) readability is what makes this book valuable.